Heart Touchers - Readers Share! Heart Toucher's Readers From Around the World Share Their Thoughts and Prayers! I hear word that they caught a couple of people here locally in the Ft. Lauderdale area suspected of involvement in the recent events. Two of the pilots were in Hollywood, where I live, on Friday. Like watching the events unfold in New York yesterday, it is all too real and horrible to comprehend. That any of them were from here is even worse, it seems. What has surprised me is the people I work and live with. That is, there are a number of people from South Africa who sobbed with us Americans as it all sinks in, what we are seeing. There are people from Puerto Rico who are also very emotional at the events at work. It has hit all, American or not, who I work with. In my apartment building, most are either here on Visas or recent immigrants and they too, are very upset and weep with those of us who weep. They feel the hurt and anger and indignation that those of us who were born here feel. This country is as much a place of hopes and dreams for the people who come or visit or immigrate here as it is for those of us who were born in this land. For all of us, seeing a flag, hearing one of our songs like "God bless America" or "Oh, Beautiful" or the national anthem is more than enough to stir the emotions like never before. I learned these as a child but I hang on to them as an adult in this time of sorrow. These are the things which unite us. I watch the reports not to hear about the tragedy, and there is so much of that out there, but to hear about what America is all about, the people who help each other, the rescue workers who dove to safety as the first tower fell, dug themselves out to help others and probably perished when the second one fell, the passengers who retook the last plane. These are people who do not care about their lives or give them so others can live. This is the greatness of America, not the buildings which were hit. 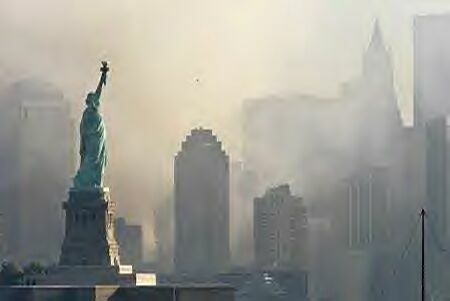 They tried to attack our heart, not realizing that the heart of America is not in a building or the tragedy but it beats in the chest of all of us Americans and you can't kill that. Our hearts break over the people lost but the best part of America is still be written in the people here lining up and waiting 6 hours to give a pint of blood, the selfless acts we may never know about. That is freedom and may it ring clear and true forever. We, Vietnamese have seen the tragedy in your country today on TV. It's such a terror, for you and for the whole progressive world. Please accept my deepest condolences and my greatest hope and wish that all will turn right for you. After the storm comes a calm. Please hope for the best. I was at work so could not see the horrific pictures unfolding on the TV but read on the internet. I am still feeling so numb from the shock, pain and still shaking as I write this mail from Ghana in West Africa. I cannot help the tears down my cheeks. I am so disoriented like some one just coming out from the effects of post operation. I am celebrating my b'day with a special prayer to God to let us learn to trust Him and look out for his grace to sustain us. I have friends ( anyone out there is my friend)and family out in America who are have communicated with me that they are fine but not fine since their hearts are out with the people. God be merciful to us in our selfish ways and my prayer is that His kingdom come and Christ rule should begin. He is to break the tyrannies of sins in this world with his Iron Rod. It is 8 am in the morning here and I woke to the horror of the attack in USA. What can I say? We hold you and all our American friends and brothers and sisters in Christ in our prayers. I am sickened by the things I am seeing on the TV and like other folk it seems like it is out of some movie. We pray for this country that says In God We Trust through this terrible time. We love you in the Lord and will keep praying from afar to keep us near to you through this shocking time. I agree totally with you that in this time of atrocity we all need to turn to God for comfort. It is a very sad situation when precious innocent lives are taken, and especially under such horrific circumstances. I know that every soul I have spoken with regarding this topic, symphathises with, and expresses their heart-felt condolences to the people of America, and those that have been injured, or lost their lives. It is without doubt that millions around the world have been glued to their TV sets since the start of this drastic fiasco. In this time of chaos, it is also without doubt that all the nations of the world need to stand together to deal with this situation, and work together to prevent such incidents from ever happening again. In such a situation, it becomes easy for one to look for the individual responsible for such drammatic events, and it becomes easy for one to lay blame on numerous individuals, or maybe even governments. Looking for exacting revenge comes foremost to all of us, and not without reason. An eye for eye, so to speak. We must remember to keep our heads, while our hearts are breaking. From the bottom of our hearts, we wish the people of America, all the strength that they need, and we let them know that they are in our most earnest prayers. I was touched by your words and also by Phil's words. This has indeed been another day that will go down in history as a day of infamy. This is the first of such for me as I was born a few months after Pearl Harbor. I too have been watching TV-- I was in Church (morning Mass) at 9 AM til about 9:30 -- I came home , made a call, then came to my office to check e-mail-- I saw the "news" on the AOL opening box and thought..."another bad movie"-- then I noticed the headlines to check-- I didnt' know what to do and think-- I have friends who work in NY and in the WTC-- and Aunt in the Pentagon... I am still waiting to hear about some of them... so far no one I know is buried in either disaster. I have been crying alot off and on praying and thinking about those people who only wanted to go to work-- or got on the plane to get to CA (perhaps vacation)-- By about 1:30 I couldn't take it anymore... I felt I needed to "do something"-- so I went to back to church... there I sat and prayed and prayed-- and cried some more for so many children who lost parents, husbands who lost wives... sisters who lost brothers-- the workers where I have been from time to time-- along with all those vacationers visiting as I too have done-- I have even been on the roof-- and oh God, those poor parents who lost children....I am so horrified and heartbroken , stunned and numb....... this is so surreal!!! Nothing can compare for most of our generation what has happened here today-- on another generation, my Mom's initial reaction was: "AUGH--- Pearl Harbor!!!!!!!!!!!" Like I am sure they said back then she quickly said-- "I don't know who they are , but they don't know who we are. We're the United States and we're Americans. They really don't know what they are doing and we will sure do whatever we need to do to fix this." I can also only hope they allowed our children in public schools to pray today--- we all need to turn to Our Creator to ask for support and help. This is indeed a day of extreme sadness! We live in a town with one of the largest Army ammunitions depot's in the United States and it is on the highest of alerts at this time and is on security shut down. No one is allowed in or out at this time. I am putting my faith above all that God will indeed watch over all of us. Last night I dreamt our town was invaded and to wake up to the reality of a shut down and high alert is something that is very uncanny. I will continue to pray for those who were injured and killed and their families. My teenage son came home today and that is all that they did today was watch all that happened on television in their classrooms. Although, our children should know that our country is in devastation and turmoil over what happened, I can't help think that it will dwell upon some more than others. My heart goes out to all those involved! MY LOve, my prayers and Light NOW! for America and for the world! Someone has to stop this craziness. I love YOU! Hello my name is Lara Bryan and I live in Johannesburg South Africa. My heart goes out to you and your family (especially your children) as your country faces this tragic time. My prayers are with you as well as your fellow country men. This is a tragedy and has shocked many. I can't even begin to comprehend what actually goes through some people's minds to do such a terrible thing, but then again I know my God can heal and restore and give back to those families that have lost in due time. I am praying for your country and for those who have lost loved one. We must really band and bond together in prayers and in spirit to fight the Evil Forces behind such atrocities! In the Name and Most Precious Blood of Jesus, let us claim that our world will be spare from a World War III. There is so much chaos and sufferings now around the world, that we can no longer go out to war! Economic-war as well as moral disintegration is too much of a thing, more so, without the Lord! Lucky for us, because we only have God to depend on! Again, my prayers are with all the victims and families of those victims in that NYC tragedy. Have a good and Godly day. The Lord is really in control. He alones has perfect plan for all of us, and the whole world. People around the world who believe in Him should get down on their knees and make reparations, and contrition for their sins of omission and commission! Kind of spooky what has gone on today, isn't it? I am thoroughly intrigued, although not surprised, that the nation is comparing what happened today with the prophesies in the Bible. I don't know about you, but it did my heart good to see the House and Senate stand together on the steps of the Capitol and sing, "God Bless America". I was also encouraged to hear President Bush quoting from the Bible. daughter is being faithful to the Spirit's prompting in her heart...and He uses her to teach me a lesson. We are doing an important thing, this raising of our children. It is scary knowing that we are raising them into such a scary and unsafe world. I want to let you know that I am committing to praying for our children...that they will, only by the grace of God, somehow maintain their childlike faith. I have been burdened for the funeral directors /staff who will be involved in this horrible tragedy. Also the department that will be handling all the death certificates. Plus all the Social Security staff and insurance people. These folks are behind the scene which we don't see. They will work just as hard as the others. Without the death certificates the survivors cannot get financial help. Thank you for letting me share this prayer request. Our God, Father of our Lord and Savior Jesus Christ is in control. As I homeschool, I just gathered the children in a circle to pray for the families that were affected by today's events so far and also for what may happen next. Together, we asked th Lord to help the families of the victims and help us be safe on our earth until we go to live with him. There was more to the prayer but when we finished Jeffrey opened his eyes and said look Mom, that looks like an angel on the back window. On our window, one of those poufy dandilion white things was waving ever so gently int the breeze, trapped in a web on the outside window shaped as you can guess like an angel. I truly believe the Lord sent us a sign to let us know He heard us. Our wonderful Heart Toucher readers share their own stories and poems about this tragic day in our history... Click on the link or photo to read them!